Jason Payne Collects his man-of-the-match prize from Match referee Grantley Culbard. 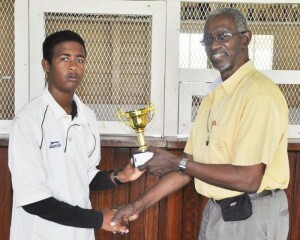 victory over the GCB President’s XI while Berbice secured a three-wicket win over Essequibo when the Guyana Cricket Board/Dave West Indian Exports Guy-NY Inter-County Under-15 50-over tournament continued yesterday. Payne removed Daniel Dharamdat (00) and Devon Allen (06) while Daniel Paul sent back Brandon Jaikarran (05) to leave the President’s XI in trouble at 10-3 after they decided to bat at Wales. Payne who got lateral movement and maintained a tidy line then destroyed the middle order to finish with 5-19 while Paul claimed 3-14 as the President’s XI were skittled for 36 in 12 overs; Orin Gibson top scored with eight in an otherwise dismal batting display. In response, Yeudistir Persaud and Andrew Samaroo added 27 for the opening stand before Samaroo was lbw to Abdul Ramsammy (1-4) for three. Persaud timed the ball well, hitting four fours in an unbeaten 25 while Shoaib Shaw made five; Demerara finished on 37-1 in eight overs. At Enterprise, Essequibo scored 112 all out in 43.3 overs, taking first strike. Berbice encountered some hiccups before they won the game in 17.2 overs, ending on 116-7. Essequibo’s decision to bat backfired as they lost five wickets for four runs before Lance Roberts and Mark Fredericks featured in sixth-wicket stand of 49 to add respectability. After Roberts who was named man-of-the-match went for 34 and Fredericks for 13, only Ameer Singh with 23 offered any resistance; Nigel Deodat snared 3-20, Gevon Shultz had 2-4 and Aaron Beharry 2-26. In reply, Jerron France and Fawaz Gafoor added 43 for the first wicket, but when both were dismissed for 10 and 16 respectively, Berbice lost their way somewhat. Off-spinner Amos Sarwan bowled with variation and control as he removed Marvan Prasad (03), Seon Glasgow (11) and Chanderpaul Govindan (00) leaving Berbice at 73-5.